Katie: It is in Dublin; Chelsie and I enjoyed our first afternoon tea of 2012, just eight days into it! 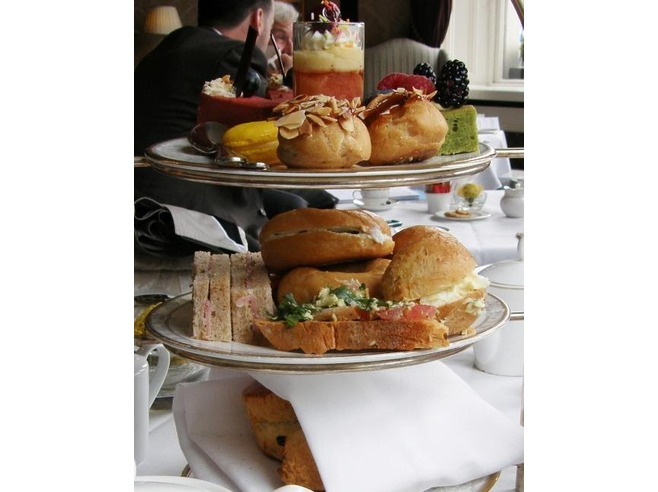 I will begin by providing you with some background history on one of Dublin's Finest Hotels, and then onto a truly Irish take of Afternoon Tea!! The Shelbourne is a five star hotel, located roughly ten minutes (by foot) from the city centre, I was told by the friendly staff about the role this hotel has played in the countries history to name but one example the Irish Constitution was drafted here! The hotel has also welcomed in its past prestigious celebrity guests. The Afternoon Tea experience begins with a well dressed doorman welcoming you to the hotel, the Tea takes place in the Saddle Room, this room is not obvious in terms of a visible sign nor particularly grand in comparison to other hotels but the atmosphere of luxury I believe is firmly maintained. In our experience the service was prompt, polite but not over whelming making guests feel inadequate in such an environment. 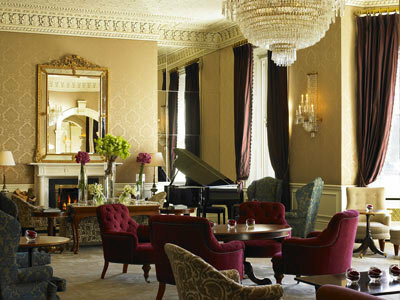 Chelsie : The elegant space with its high-ceiling and beautiful chandeliers added with big window's illuminate the Lord Mayor's Lounge the sunlight that streams from its windows overlooking St. Stephen's Green really sets a warm cosy feel, if your escaping the weather or need a place to re-energised after a day shopping or site seeing this is a perfect place to take a rest, after escaping the rain we headed inside, the piano really adds a nice setting to escape the busy city for a few hours. Chelsie and I mutually agree this Afternoon would be regarded as a 'Classic' Afternoon Tea, It would also be a lovely introductory Afternoon Tea for those viewers who have never experienced Afternoon Tea.